One of the first-fruits of Mr. Ruskin's teaching is to be found there in the new Museum of Physical Sciences, begun in 1855 under the superintendence of Messrs. Deane and Woodward, and since carried on at intervals. However much opinions may vary as to the general effect of this building, there is no doubt that it exhibits in its details far more originality and grace than were to be found in most contemporary examples of secular Gothic. The principal front consists of two stories with an attic lighted by triangular dormers in the roof. This block is divided in the centre by a tower carried to the height of three stories, and surmounted by a wedge-shaped roof. Under the tower is the main entrance, spanned by an acutely-pointed arch, richly decorated with carving in low relief and voussoirs of dark brown stone and grey marble placed alternately, but at irregular intervals. The first-floor windows partake of an early Italian character. They are divided into two lights by slender marble columns, the arch head above being pierced with circular lights delicately cusped. 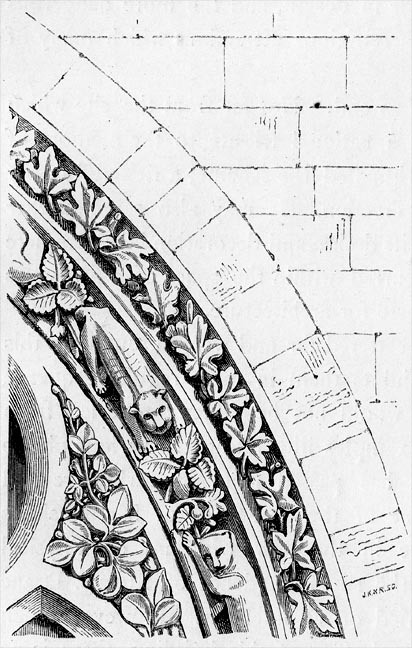 The spandrils of the tracery and the arch mouldings which enclose them are filled with relievi of foliage and animals arranged with considerable care and executed with great refinement. The roof, gay with purple and greyish-green slates symmetrically disposed, contrasts admirably with the rich cream colour of the Bath stone masonry, which in its turn is relieved by marble of various hues introduced in the details above mentioned. The chromatic effect the whole seen on a bright sunny day sur- rounded by natural verdure and with a blue sky overhead, is charming. The laboratory on the right hand of the principal front is suggestive in its general outline of the well-known Glastonbury kitchen. This building, together with the residence and offices recently erected on the other side of the Museum, helps to break the external formality of the Museum front and to lend the composition a picturesqueness which is more English than its individual features. It is, however, in the internal arrangement of the Museum that we trace most distinctly the influence of those principles which the author of 'The Seven Lamps so earnestly strove to inculcate. Just as the Pre-Raphaelites — while they existed as a school — aimed at representing the heroic incidents of ordinary life, so those architects who accepted Mr. Ruskin's guidance endeavoured to realise beauty in their art not by literally reproducing the decorative features of Mediaeval work, but by investing with its spirit as far as possible the skill of modern workmanship and the materials of modern use. A large quadrangle had to be roofed with glass and iron — and the difficulty was to do this without limiting the design to the merely structural features of the Crystal Palace or condescending to the vulgar details of a railway terminus. Under these circumstances Messrs. Deane and Woodward did their best to Gothicise their ironwork, and though the attempt displayed great ingenuity it can hardly be called successful. The system of construction adopted may be good of its kind. The system of ornamentation adopted may be good of its kind. But the two are not happily associated. 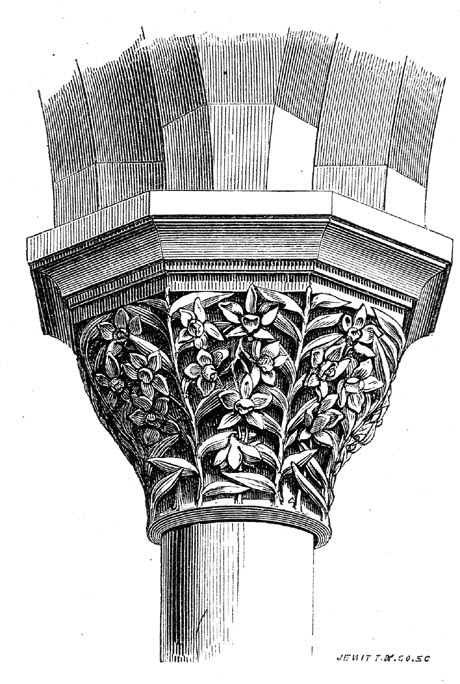 As a rule it is far better to use wrought or beaten metal than cast metal for decoration; but whether in enriching the capital of an iron column the same type of decorative mask should be used as is ordinarily employed for a stone capital may be questioned. In the latter case we know that the carved work represents a portion of its integral strength more or less weakened by the parts cut away. 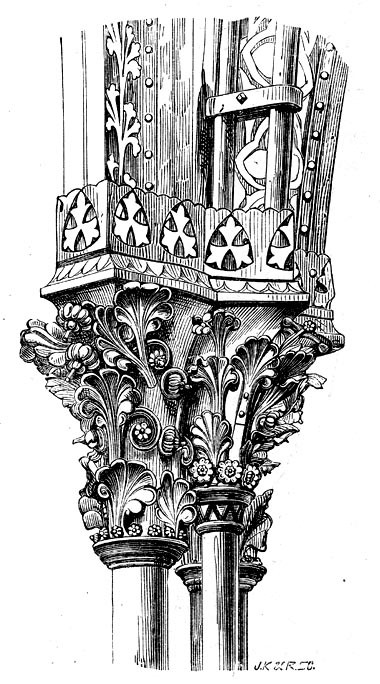 But in the case of an iron capital to which beaten metal is subsequently attached, as at the Oxford Museum, we feel that the ornaments of leaves and flowers, however excellent in themselves, are mere additions having no sort of relation to the constructive feature which they adorn and claiming a raison d'être of scarcely higher pretensions than the plaster enrichments of a brick cornice. They appear unnecessary, not because they are simply decorative (a reason which would condemn half the old forms of ornamental ironwork) but because they are confessedly applied decorations to a feature whose'very form is regulated by practical considerations. Objections of an analogous kind might be raised to the constructive arches formed of iron rods-'m the same quadrangle. Iron rods have their use as ties or struts, but the metal requires a different section when it is required to do service as an arch.